Every day, I have the most spectacular walk in the diocese. Whether it’s early in the morning, sometime during the day, or late at night, walking to and from the Cathedral is breathtaking. Okay, perhaps it’s not THE most spectacular walk (there are several around the diocese I’m sure), but it certainly ranks at the top. Especially when the outline of the massive Romanesque structure atop the hill is framed by the city lights below, creating a “European” aura. Or when you look up at the spires on a sunny day, their peaks piercing the bright blue sky as if they were reaching up to heaven. Or when the setting sun casts giant shadows on surrounding houses, magnifying its immensity. There are so many different perspectives one cannot describe them all. You just take it in and thank God, and thank the foresight of the people of the diocese. At times, you can feel the Cathedral speaking to you. It screams the sacred, the divine, the transcendent, the mystical; other times it whispers the personal, the intimate, the familiar, the hospitable. It speaks of the goodness of God and the beauty of God. It speaks of the faith of people and the commitment of people. There are other voices too. The voices of so many who have knelt and prayed within her holy confines. Voices that echo from wall to wall. Voices from the past; voices of the present. Those who built her; those who restored her. Those who grew up in homes surrounding her; those who traveled from parishes far and wide because they belonged to her. Voices of the young and the old, the rich and the poor, the sick and the healthy, the farmer and the urbanite, the native and the immigrant, the sinner and the saint. The voices are the same today, but the tongues have changed. Though English is clearly the predominant language, there are other accompanying vernaculars that can be heard. Gone is the Gaelic and the German replaced by the Spanish and the Swahili…and a host of others. But why not? She is the local church of our people, yes? Absolutely. And she is also the universal church for every Catholic. 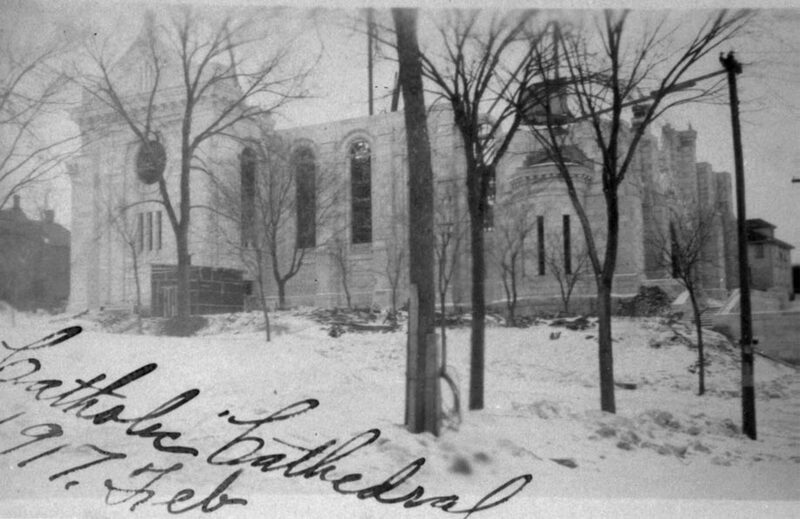 Though the cornerstone of our Cathedral says “1916,” construction started in 1915. With a spirit of optimism, parishioners from 99 Catholic parishes and 81 missions in the diocese contributed funds to build a tribute to their Catholic faith. A Cathedral they could call their own. A Cathedral on the prairie. Emmanuel Masqueray, her chief architect, would employ his trade well by capitalizing on her rural distinction. The spires of the Cathedral would ascend from her façade as sprouts of grain ascend from the earth. He would design them so that they might look like heads of wheat. The first Mass was celebrated in an “unfinished” Cathedral on December 8, 1918, the Feast of the Immaculate Conception. Yet, already the Cathedral had been named in honor of St. Joseph. The foster father of Jesus would be the protector of all who entered her doors. She was dedicated on May 7, 1919. It took four long years and a world war to boot to build her. But here she is, still standing tall and strong after 100 years. She has much to offer yet to the many from our diocese and around the world who come to see her. They might come to see her beauty, but they leave knowing they have encountered the Living God. The Cathedral of St. Joseph will be celebrating the centennial of its dedication in the late days of April and early days of May. Additional details of these events can be found at www.stjosephcathedral.net. Sunday, April 28 – Archive Display: “Remembrances & Relics of 100 years” – 8:30 a.m-2 p.m.
Monday, April 29 – Historical Presentation: “A Vision Realized” – 7 p.m.
Thursday, May 2 – Cathedral Choir Concert: Founders’ Concert – 7 p.m.
Friday, May 3 – Anniversary Bash, “Dinner & Music” – 6 p.m.
Tuesday, May 7 – Transept/O’Gorman Choir “Cathedral Masterpieces” concert – 7 p.m.